History books about design are generally full with the names of inventors and creative thinkers that have made an impact on contemporary culture. Some, unwittingly, have become synonymous with a particular object, like the Hoover, for example, while others are associated more with a particular process. Andre-Charles Boulle (1642-1732) is one such creative genius who has given his name to a style of decorative application that has been the epitome of sophistication and craftsmanship for more than three centuries. The technique attributed to him allows the most intricate of designs to be cut and matched from contrasting materials and laid onto a surface for decorative effect. The process remains a viable option today and in some instances it is the only way to replicate this style of work with any degree of authenticity. 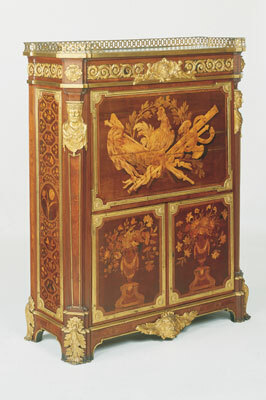 Although the Boulle technique was still being used, Parisian marqueteurs undertaking floral marquetry from the second quarter of the 18th century onwards used a different technique, which had its origins in intarsia. Literature on furniture manufacture techniques and, in particular, marquetry, is rare during the 17th century and for much of the 18th. However, during the second half of the 18th century, many more books were written and published on these subjects. The cabinetmaker's craft was discussed in detail in Diderot's Encyclopedie of 1751-80 and in 1772 the carpenter Andre-Jacob Roubo published a major work on the subject, L'Art du Menuisier. Roubo's work remains the best and most comprehensive book on 18th-century cabinetmaking, even though some modern cabinetmakers have criticised the fact that not all the recipes he quotes can be successfully replicated. Published during one of the richest periods of French marquetry, the techniques Roubo discusses include many of the most important used by 18th-century cabinetmakers and marqueteurs. He provides a detailed discussion of what may be called the advanced inlay technique. This technique was used to produce the marquetry made by such master-craftsmen as Jean-Pierre Latz (c. 1691-1754), Jean-Francois Oeben (1721-63), Jean-Henri Riesener (1734-1806) and Jean-Francois Leleu (1729-1807). Analysis and conservation work on furniture by these makers have revealed distinctive tool marks and outline drawings cut into the carcass below the marquetry. Further evidence of the use of this inlay technique is found in a painting representing an English marquetry workshop of the late 18th century. Executed by the Swedish painter Elias Martin during his travels in England between 1768 and 1780, the painting depicts a craftsman cutting a piece of wood with a fretsaw while another gouges out a cavity in a table top using a small inlay knife. Although it is unlikely that all 18th-century Parisian cabinetmakers used this technique, it is safe to assume that the majority did. Many were of foreign, particularly Flemish, origin. They lived and worked in the same area of Paris around the Faubourg Saint Antoine and undertook their apprenticeships in the same workshops. 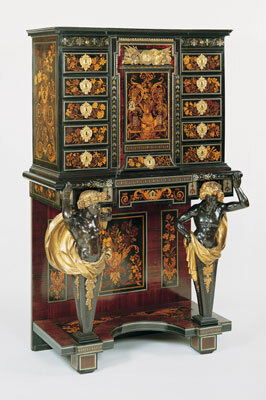 Despite the fact that this technique is closer to intarsia than to Boulle marquetry, this late 18th-century veneered decoration is also generally described as marquetry. On the back of the roll-top desk - bureau a cylinder - made around 1770 for the comte d'Orsay - now in The Wallace Collection, London - Riesener has depicted a bunch of lilies taken directly from an engraving by Louis Tessier. A modern reproduction of this detail has been made, using the technique described by Roubo, in order to illustrate the process. The marqueteur would have made a tracing of the Tessier engraving, copying the detail of each individual flower and leaf. 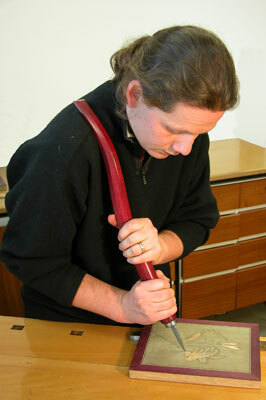 Just as in the Boulle marquetry technique, this tracing would have been transferred or glued onto a piece of veneer, which would then have been prepared in the same way. Again as with Boulle, a stock of ready-cut finished flowers would have been built up, the 1763 inventory of Oeben's workshop, for example, recording a chest of pre-cut marquetry flowers. When a piece of furniture was to be veneered with floral decoration, the first stage would involve gluing a sheet of background veneer onto a completed solid wood carcass. A simple drawing of the final composition would then be outlined on the veneer to assist with the placement of the flowers and marquetry elements. The flowers and marquetry elements selected for the design would be placed on top of the background veneer and carefully marked out into the veneer using a scriber. Turning to his inlay knife, with its long handle mounted with a sharp blade, the marqueteur would cut deep into the background veneer along the scriber lines. This is the process that can create the distinctive marks on the solid wood carcass. The cut-out portion of the background veneer would then be removed, creating a cavity into which the marquetry elements would be fitted and glued. Each flower and other decorative element was individually inlaid using this technique. The top of the piece of furniture would then be sanded, engraved if necessary, and a finish applied. 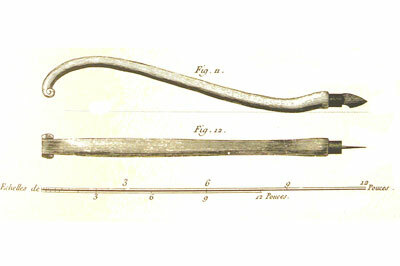 Despite its time-consuming nature, this technique was preferred to the Boulle technique during the second half of the 18th century. Its advantages, besides those of technique, lay in the complete liberty of interpretation of the marquetry composition which it afforded the marqueteur and the exactness with which each marquetry element fitted into its space. A flower or leaf could easily be added or left out depending on the maker's whim. Such freedom allowed the resulting marquetry composition to be adapted, often superbly so, to the piece of furniture with its bronze mounts and other decorative features. 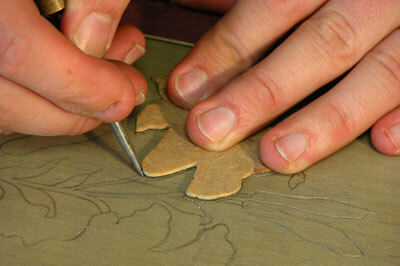 On the other hand, this technique only allowed one marquetry composition to be completed at a time. 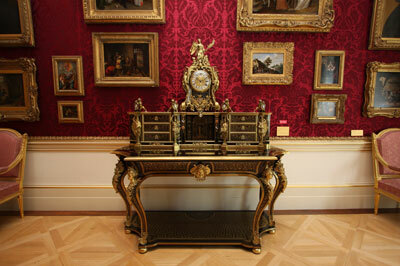 With intensive practice and long experience the 18th-century craftsmen produced high quality marquetry very quickly. 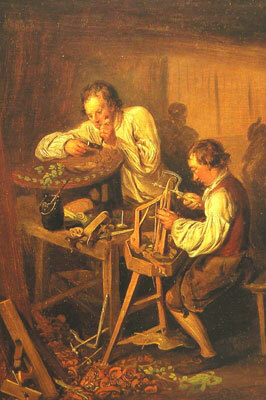 However, the industrial revolution provided the impetus in the next century for the development of faster and cheaper techniques which would alter the course of standard marquetry practice. There are a few rare examples of 19th-century marquetry using inlay, but today the technique is virtually extinct.